Clickbait this, clickbait that. “You guys only write blogs FOR THE CLICKS,” the demented commenters say. Unfortunately, we do want people to actually read the stuff we write, yet we have no control over what blows up and what does not. That is the will of the internet, and she works in mysterious ways. So, these are the stories that you—the deranged masses—read the most this year. In all seriousness, you guys have great taste. There’s a wide range of stuff here, from heroic car owners willing to do anything to save their precious vehicles, to a high speed run from behind the wheel, to just how doomed Uber is (turns out, pretty doomed). The determinations of “Most Popular Posts” were done by the Fusion Media Group’s Analytics Team, so if you’ve got any squabbles, take it up with them. We’re just the messengers here. In major cities you’ll often find bumps in the sidewalk. But no, they’re not for extra grip when you’ve forgotten to take off your bowling shoes. They’re for the blind, and the United Kingdom even has a whole system in place for them. It’s fascinating stuff. Ron Dauzet has a collection consisting of over 200 cars in Northfield Township, Michigan. Or, rather he had a collection of over 200 cars. That’s because the local authorities are making him get rid of it, to the tune of 20 cars a month. We’ve been keeping up with Ron and the sad fate of his collection, and last we heard, he’s been resorting to scrapping a few of them. No car collection deserves this. Koenigsegg set a public highway record of 278 mph, while simultaneously marking its Agera RS as the fastest production car in the world. It turns out that from behind the wheel, 278 mph is quite fast. You may think there’s some science behind the blogs, like we know what will go bonkers at all times. I assure you, this is not one of those times. Did you like that it was a Dodge? That it reminded you of a movie? Nah, I’m betting that it was the Hellcat. More than 661,000 of you, as of this writing, like Hellcats. This one must’ve been a hit with the Pretty Woman fans. It had everything – the rude fancy car dealership, the young guy with some cash to spend, and a big reveal at the end. Here’s hoping Cody ended up with the car of his dreams in the end. Most people, when faced with an erratic car on the highway, might just avoid it and carry on. Some people might even call the authorities, hoping a cop or an ambulance might pick them up. But the rare heroes among us will not only do that, they’ll put themselves and their car on the line to potentially save a life. When one German driver saw another motorist’s car slamming against a motorists car multiple times, he used his own vehicle to slow the out-of-control car down. Sure, both cars suffered damage, but when it was later revealed that the “erratic” motorist was having a stroke, it looked like the Tesla driver acted in the nick of time. It can be incredibly tough to make a television show, put your heart and soul into it, and then have the network screw it all up. It might even make you want to never do it again, much like Edd China of Wheeler Dealers. Good on you, Edd. We’d watch you anywhere. Uber might be less doomed now that its controversial former CEO, Travis Kalanick, is out of the top job. Still, almost a year later, things over there are still not great. Perhaps new leadership at the top and an investment from Softbank can get Uber acting like an actual company and not, you know, a frat house. Who among us hasn’t return into this exact same scenario, multiple times in their own life? Just last week I found my old Studebaker. Left it in the same exact driveway I parked it in 72 years ago. When Hurricane Harvey struck Texas, Cody Crochet knew he had to do one thing before the floodwaters came. 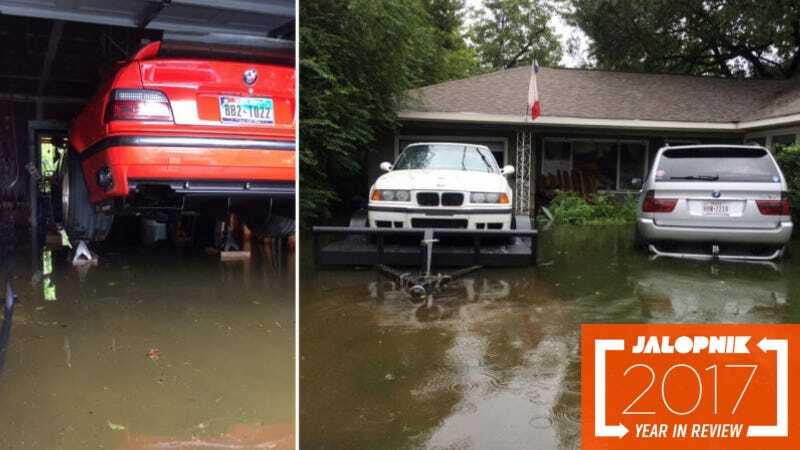 He had to save his beloved BMWs, an E36 M3 and an X5. And he didn’t just put them on the top level of a parking garage, or anything like that. First, he started with jack stands, but as the water began rising higher and higher, he moved on to garden blocks. Eventually it was waist-deep, but his BMWs thankfully made it through the storm high and dry. Hurricane Harvey brought massive devastation and loss to Texas, but this is one good story that came out of it, and more than 932,000 of you appreciated it.